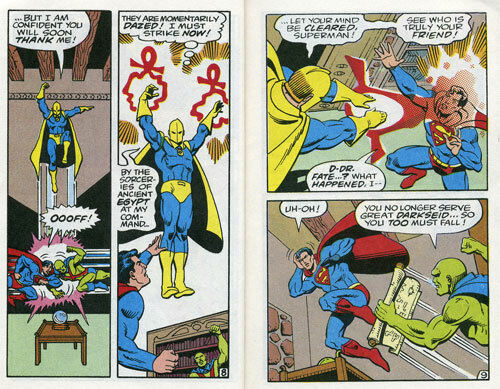 CELEBRATING DOCTOR FATE (AND NEARLY BLUE DEVIL) IN THE SUPER POWERS COLLECTION! 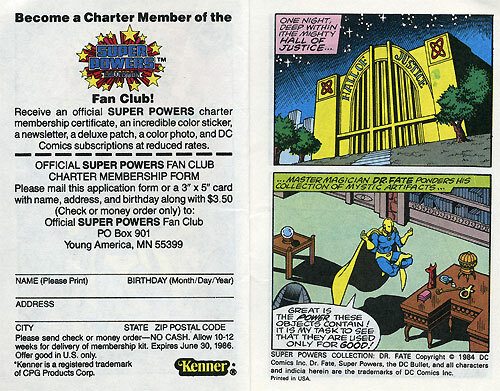 Fourteen different blogs have combined forces today to celebrate the 25th anniversary of Kenner’s Super Powers Collection! 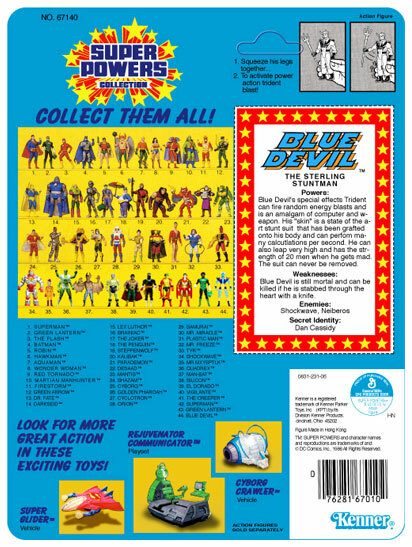 While we’ll be looking at Doctor Fate here (as well as the proposed Blue Devil figures), every other blog in the crossover will cover different action figures or mini-comics from the Super Powers Collection. Back in 1984, Kenner released the first wave of Super Powers action figures based upon heroes and villains from DC comics. While there was a fairly large marketing campaign, I doubt they realized just how celebrated these figures would become. The first wave of figures had characters like Superman, Batman, Robin, Wonder Woman, Green Lantern, Flash, Aquaman, Hawkman, the Joker, Lex Luthor, Brianiac and the Penguin. Two more waves were released, bringing the line to a total of 33 figures. One of the primary reasons the Super Powers Collection became so successful was that the molds were very good. These figures actually looked like the characters in the comics. That may sound like a no-brainer in the age of DC Direct and McFarlane Toys, but keep in mind prior to the Super Powers Collection adherence to characters likeness wasn’t exactly a priority. Another reason for the line’s success was the inclusion of popular heroes and some relatively unknown characters (I mean, who really demanded a Tyr figure anyway?). This mixture proved to be popular with comic book fans and kids alike. Finally, some people will argue that the “Power Action” hidden gimmick in each figure was a big selling point. I don’t necessarily agree with that, but hey, everyone’s entitled to their own opinion, right? The Doctor Fate action figure was released as part of Wave 2 in 1985. 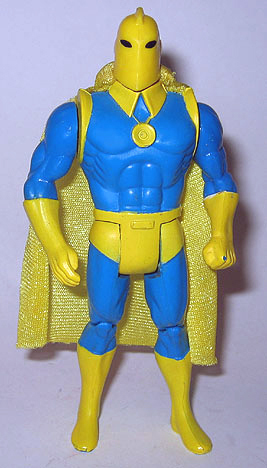 This figure was really the first tangible piece of Doctor Fate merchandise, outside of his comic book appearances. To this day, I still think his helmet looks phenomenal! Check out the Super Powers Collection Doctor Fate action figure below! Below-Left is a picture of the Super Powers Collection Doctor Fate still on the card. This is the Canadian version, which I’ve seen advertised recently on the card for as much as $369 in near-mint condition. 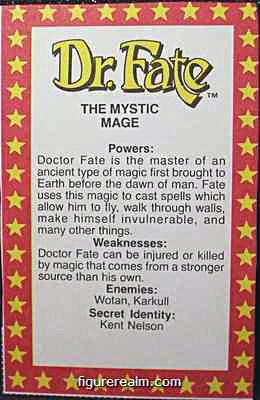 Below-Right is the file card found on the back of the packaging explaining more about Doctor Fate. 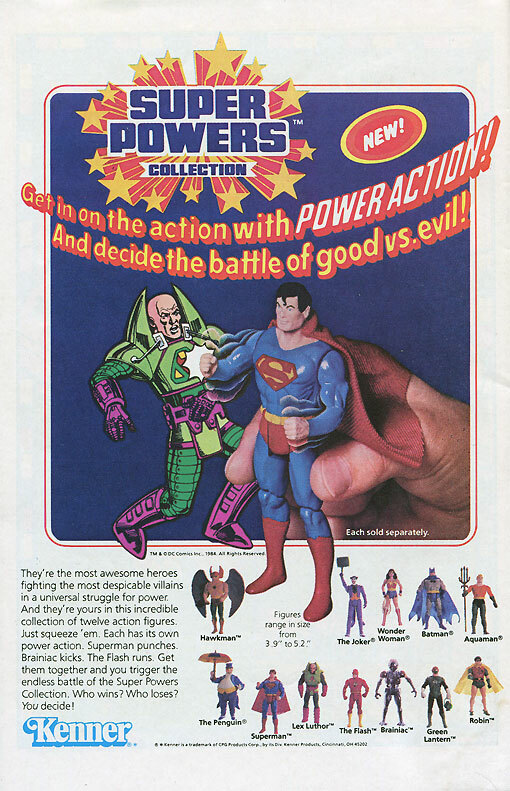 Each of the Super Powers figures had a hidden gimmick, referred to as “Power Action”. 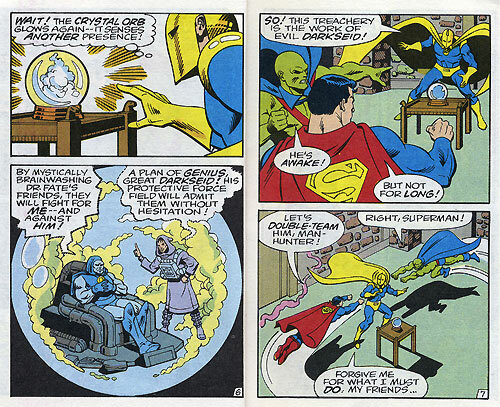 In Doctor Fate’s case it was a “Power Action Mystic Spell Cast”. By squeezing his legs together, his arms would move up and down. I suppose this was to simulate Doctor Fate casting one of his trademark Ankh Bolts. While the gimmick was nice (especially since it didn’t disrupt the appearance of the figure), it really wasn’t necessary to the character. To see the “Power Action Mystic Spell Cast” in action, check out the Super Powers review site done by Cool Toy Review. 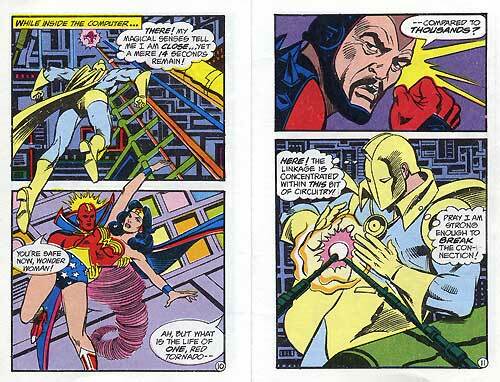 Go to the bottom of the page and roll over the photo to see Doctor Fate in action. 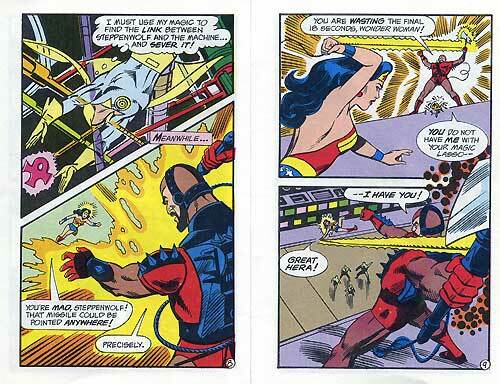 The first two waves of Super Powers action figures each came with a mini-comic book starring that particular character. These comics were 4.5 inches by 2.75 inches, and had 13 pages of story. Not much information exists about who the writers and artists were for these mini-comics. Paul Kupperberg (writer of the full-sized DC Super Powers mini-series from 1985 and 1986) had this to say about Kenner’s Super Powers Collection mini-comics, “I wrote only one of the Kenner minis, for Steppenwolf (#13). Alas, I have no real memory of having done it. Art looks to be Jose Delbo. The rest were probably written by the likes of Jack Harris, Rozakis, and the like. Wish I could remember more about them: don’t even recall who the project editor was…probably Barry Marx, who worked under Joe Orlando in Special Projects.” Special thanks to The Aquaman Shrine for the quote! 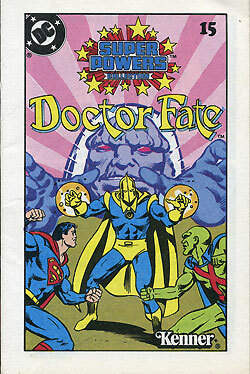 Doctor Fate had his own mini-comic in which he battled the brainwashed Superman and Martian Manhunter. 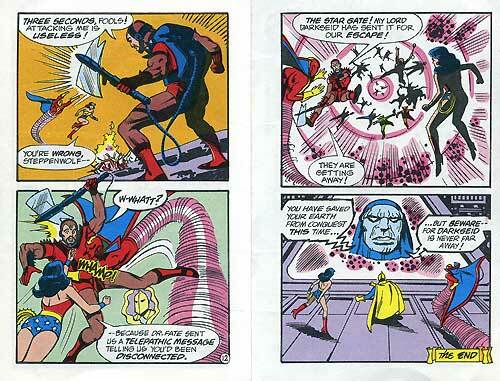 The mini-comics served to introduce the characters to new readers, as well as to promote other action figures in the line. 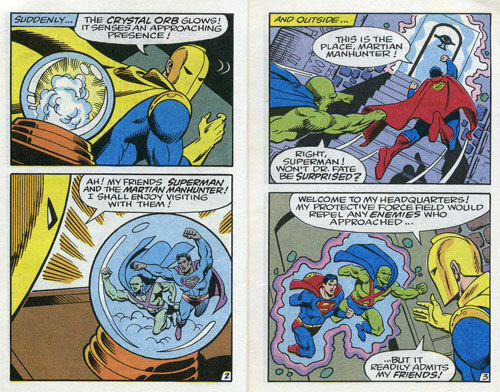 While both Superman and Martian Manhunter co-starred in Doctor Fate’s mini-comic, they also had figures of their own in the Super Powers line. 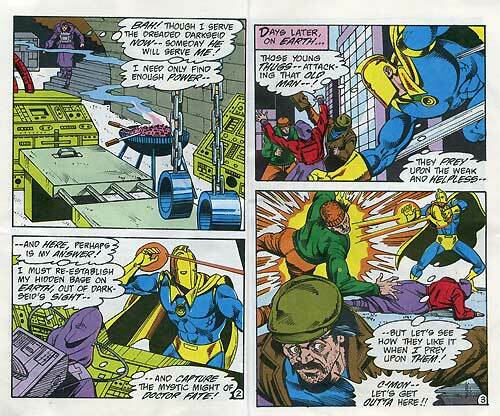 In the same vein, Doctor Fate appeared in the mini-comics of Steppenwolf, Kalibak, Desaad, and the Parademons. For more Superman Super Powers coverage, be sure to check out Michael’s blog today, FORTRESS OF BAILEYTUDE. 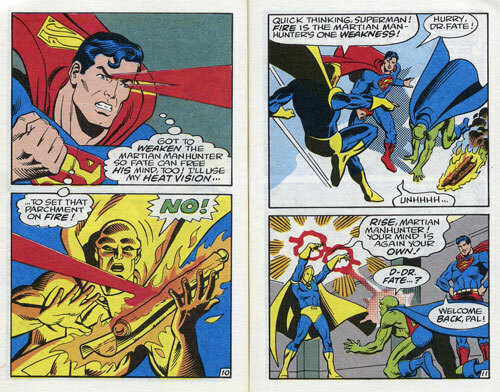 For more on Martian Manhunter’s Super Powers activities, be sure to check out Frank’s IDOL-HEAD OF DIABOLU blog today. 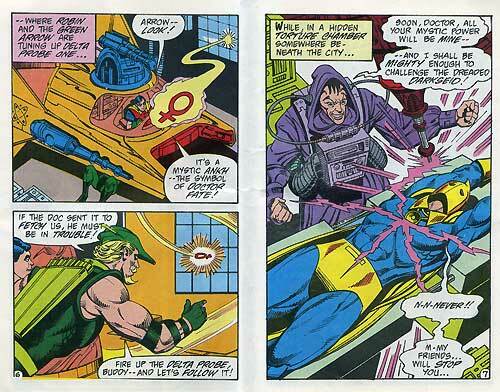 I remember at the time being very confused by Doctor Fate’s mini-comic and his appearance in the full-sized 1985 DC Super Powers mini-series. 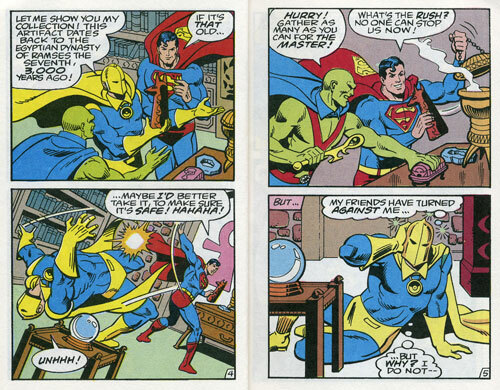 In both stories, Doctor Fate (who was from Earth-2) was interacting freely with characters from Earth-1. This made no sense to my youthful continuity-laden brain. While I knew there were rare crossovers between the two Earths, it would have been worth mentioning if the good Doctor had indeed crossed the multiverse. 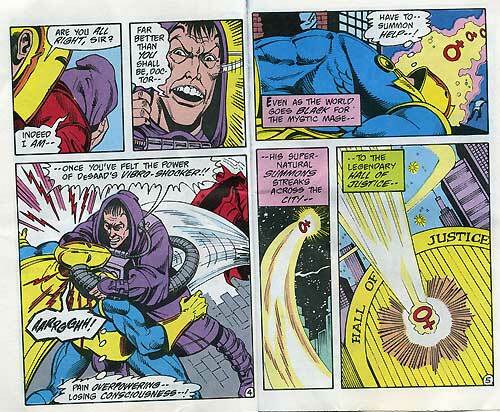 The truth behind Doctor Fate’s presence would become apparent five months later when Crisis on Infinite Earths began to wrap up. The multiverse was destroyed, leaving one unified Earth in which Doctor Fate coexisted with all the other DC characters. However, for those five months I was one confused kid. 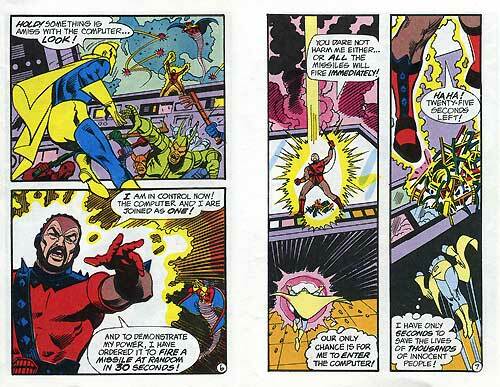 For Doctor Fate’s involvement in the Parademons mini-comic, check out FIRESTORM FAN today for all the details. Finally, it wouldn’t be a Doctor Fate comic tribute without showing some Ankh Bolts!!! Many people don’t realize this, but there were additionally planned, yet unproduced action figures for the Super Powers Collection. Turns out that Kenner was working on several figures for release after the third wave. You can read all about it, see presentation artwork, and mock-up figures by clicking here. Two of the unproduced figures were Blue Devil and Shockwave (a Blue Devil villain). While we don’t know when they were hoping to release them, we do know the Shockwave figure got fairly far along in the manufacturing process. A prototype for the Shockwave figure was found by a collector and can be seen below. The detail is amazing on this prototype! 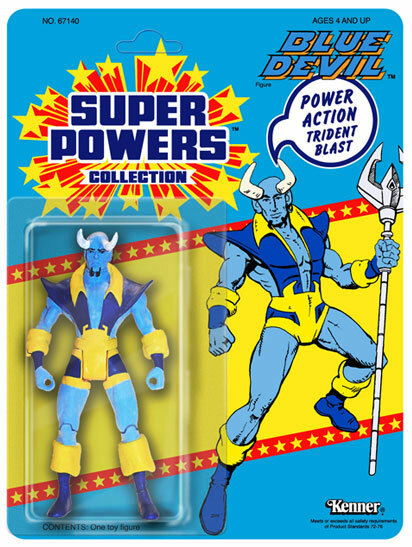 Below is a custom mock-up of what Blue Devil’s Super Powers action figure could have looked like. Nicely done by Jason Geyer. It makes me sad these figures never came to be. They would have been a revered part of my childhood. Rob (the blogger who inspired most of us to start our own superhero blogs) rolls out the pomp and circumstance for the King of the Seven Seas over at The Aquaman Shrine. Also, thanks to Rob for the excellent “Crisis on Earth-Blog” logo! **UPDATE** Rob followed up a couple days later with an additional post on the Super Powers Give-A-Show projector. 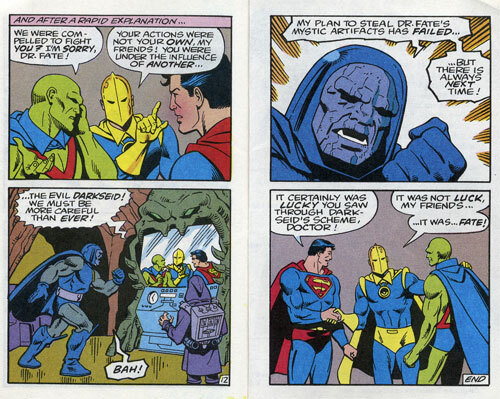 Frank investigates J’onn J’onzz, the Manhunter from Mars, at Idol-Head of Diabolu. **UPDATE** Frank followed up with four additional posts. (1) Doctor Fate mini-comic, (2) Mantis mini-comic, (3) Martian Manhunter Super Powers action figure, and (4) Super Powers #1 Martian Manhunter biography. Tommy applies his detective skills to the Batman universe of characters over at the Bat-Blog. Also, special thanks to Tommy for the fantastic “Super Powers 25th Anniversary” logo! **UPDATE** Tommy did eight separate Super Powers related posts. (1) Super Powers 25th Batman & Robin Wallpapers, (2) Batman-related spin-off products, (3) The Penguin action figure and mini-comic, (4) The Joker action figure and mini-comic, (5) Batman, Robin and Riddler toys, comics and vehicles, (6) Super Powers Batman-related cup holders, (7) a post with links to all the other participating blogs, and (8) Super Powers action figure and vehicle original production art. Running side-by-side with Kelson is Dixon’s Flash blog over at Crimson Lighting. **UPDATE** Dixon followed up with four additional posts. (1) Super Powers Flash action figure, (2) Super Powers TV commercial with Flash, (3) Super Powers #2 comic book cover, and (4) complete Super Powers Flash mini-comic. Frank explores the figures and mini-comics that might have been for Justice League Detroit. **UPDATE** Frank has followed up with two additional posts, one on the Super Amigos Vibe mini-comic and the other on the Super Amigos Vixen mini-comic. Luke provides the rundown on the winged wonder, Hawkman, over at the cleverly named blog Being Carter Hall. **UPDATE** Luke followed up with another post on Super Powers Puffy Stickers. 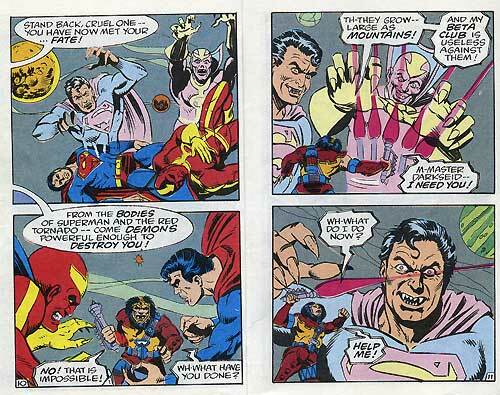 Doug puts a new spin on the adventures of Red Tornado today over at his Doom Patrol blog, My Greatest Adventure 80. Michael will be providing up, up and away coverage today of Superman over at the Fortress of Baileytude. Frank tackles as many Super Powers mini-comics today as humanly possible over at his blog called … nurgh … **UPDATE** Frank managed to get through all the mini-comics! Starting with #1-8, then #9-16, and finally #17-23. 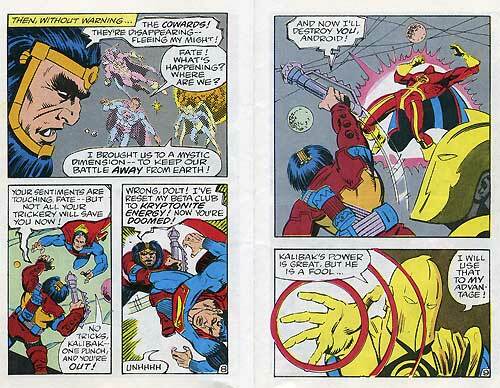 Finally, today I’ll be tackling Firestorm’s Super Powers antics over at my other blog, Firestorm Fan. **UPDATE** A surprising fifteenth entry appeared by Michael over at The Legion Omnicom covering the Tyr Super Powers action figure from the Legion of Super-heroes. Thanks for joining in Michael! While the following blogs are not participating in today’s crossover, I’d like to thank them for their support. For various reasons, they were unable to join us today but have been very supportive of the project. Thanks! **UPDATE** Bubba Shelby was also kind enough to promote our blog crossover on his site Toyriffic. In September, Bubba Shelby did a post on the Super Powers Parademon action figure. **UPDATE** Matt over at No Cure for Comics and PopCultureShock discussed the crossover and even included a Super Powers TV commercial! **UPDATE** Reis over at About.com Guide to Action Figures talked about our blog crossover. What a great series of action figures! For those of us who owned some back in the day, we’ll never forget the magic of these toys. My thanks to all the bloggers involved today in this crossover event! Happy Birthday Super Powers Collection! I like that Blue Devil and I share a weakness. We’re both vulnerable to being stabbed in the heart by knives – dubya tee eff? 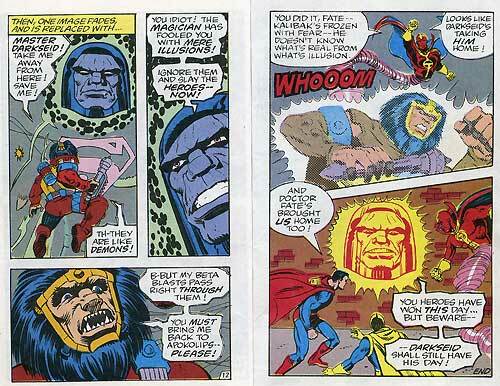 I agree that the Super Powers figures’ actions were pretty terrible, but the figures were great. I remember being sort of confused by the line, though. I didn’t know a whole lot about the DC Universe at the time; so when I saw the figures of characters that weren’t on Super Friends, I was sort of confused as to who they were. I found some of these guys, still in their original packaging, at a church garage sale in Crawfordville, FL. about two or three years ago. Paid 50 cents apiece and found Green Arrow, Brainiac and one other I can’t recall right now. Awesome idea on the crossover. Heading to check other blogs now. 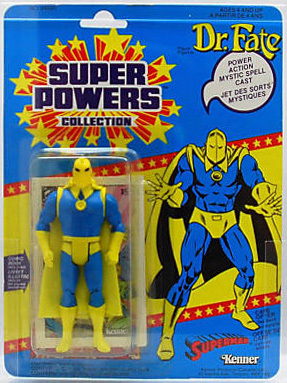 The SP Doctor Fate was one of my favorite toys from my childhood. I had no idea who the character was, but his triking, two-tone costume made his visual extremely appealing. I still have him today, although I am pretty sure I do not have his cape. Classic design for a classic character! Wish I had known about this, I would have done an entry on Tyr! Here’s my 2006 entry on him at the Legion Omnicom.